(Newser) – Workers in New Orleans began removing the first of four prominent Confederate monuments early Monday, making it the latest Southern city to sever itself from symbols viewed by many as representing racism and white supremacy. Trucks arrived to begin removing the first memorial, one that commemorates whites who tried to topple a biracial post-Civil War government in New Orleans, around 1:25am in an attempt to avoid disruption from supporters who want the monuments to stay, the AP reports. 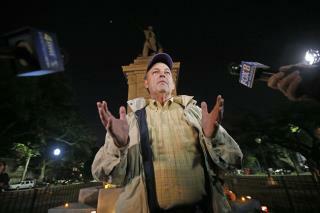 City officials say some monument supporters have made death threats. Workers who were inspecting the statue ahead of its removal could be seen wearing flak jackets and helmets. As long as you are rewriting history make sure you take down any reference to the muslim Brotherhood, malcom X, and the rest of the racist people of color. Wait a damn minute here...the ORIGINAL teaser was "New Orleans Begins Removing Confederate Statues". Now it reads "New Orleans Starts Taking Down 'Aberration'". What the f*kk Newser?? Wasn't the original, perfectly succinct, teaser good enough for your Liberal hearts? Or is it that you just couldn't resist twisting the knife in people who believe this is a travesty and an attempt to rewrite history? I'm not talking about the statue commemorating the White League. I'm talking about the nationwide movement to remove EVERY symbol of the Confederacy. This is a damn fool's errand as the Civil War is a part of our national fabric and is a huge part of this being a great country. Whether you agree with them or not, many people view the top Confederates as heroes and the statues and other monuments as a way of honoring the heritage of the region and the bravery of those men. Trying to remove those symbols will ultimately lead to increased resentment and belligerence from people all over this great country, having the reverse effect of what Liberals are aiming for. This is pure lunacy. Wait a damn minute here...the ORIGINAL teaser was "New Orleans Begins Removing Confederate Statues". Now it reads "New Orleans Starts Taking Down 'Aberration'". What the f@kk Newser?? Wasn't the original, perfectly succinct, teaser good enough for your Liberal hearts? Or is it that you just couldn't resist twisting the knife in people who believe this is a travesty and an attempt to rewrite history? I'm not talking about the statue commemorating the White League. I'm talking about the nationwide movement to remove EVERY symbol of the Confederacy. This is a damn fool's errand as the Civil War is a part of our national fabric and is a huge part of this being a great country. Whether you agree with them or not, many people view the top Confederates as heroes and the statues and other monuments as a way of honoring the heritage of the region and the bravery of those men. Trying to remove those symbols will ultimately lead to increased resentment and belligerence from people all over this great country, having the reverse effect of what Liberals are aiming for. This is pure lunacy.